I take it all back. I love the scrappy look of my Metro Link! Getting it all pieced together made a a huge difference. My husband even said he liked it so much he wouldn't mind having it hung on the wall. It's a bit big for that, but that was quite a compliment from my non-quilty guy. It's a keeper. I wish I could quilt it right away, but another quilt is using all my basting pins at the moment, so I'd better get to it first. I'm making some progress on my Metro Link quilt top. I didn't realize when I bought the pattern that many of the pieces finish to just 1" x 2"! Eep. 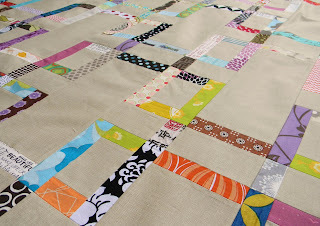 The scrappiness of this quilt is one of the main things that drew me to the pattern. I've been piecing it randomly, just pulling the next piece from the pile only vetoing if the same fabric is already in the block. I'll admit that at this point I'm not loving the individual blocks and kind of wishing I'd limited my color palette instead going completely scrappy. I'm hoping that will change when I see it all together. The tooth fairy is scheduled to make her first ever visit to my house this week, so some preparations have been made. I worried about the precious tooth getting lost amidst stuffed animals and pillows and blankets, so I asked the internet for help. 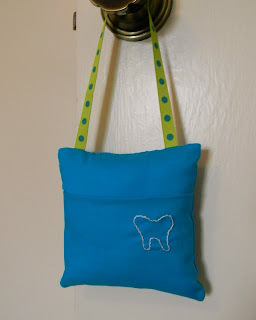 I found this cute idea of a tooth fairy pillow over at Sew Mama Sew. Just tuck the tooth inside and hang from a bedpost or door knob. The fairy can then easily and quietly switch it out during the night for a dollar or two (how much does she leave for a tooth these days?). I finally finished my solid hexagon project. Yes, it is just pillow sized (20" square), and it still seemed to take quite a while. Hats off to those of you who are persevering through much larger hexie projects. I'm glad I decided to hand quilt it. 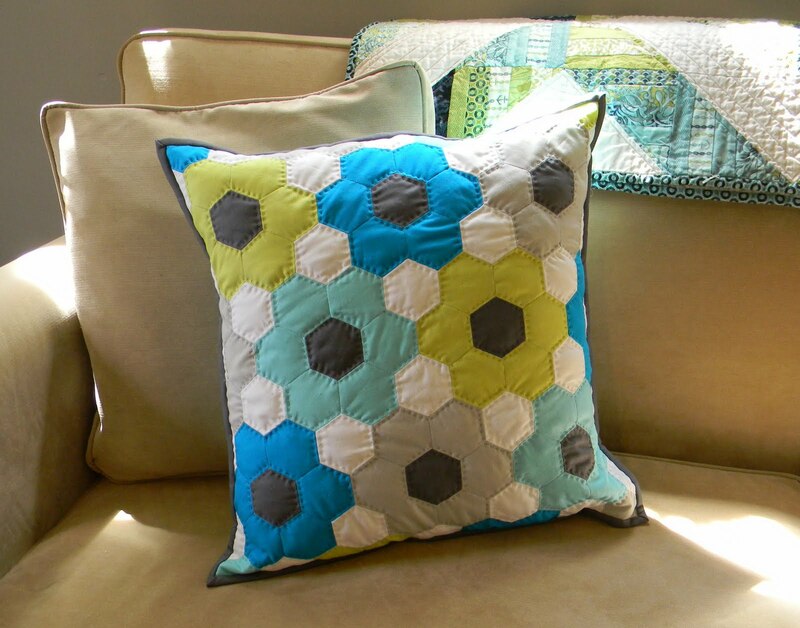 I love how the embroidery floss highlights each hexagon. I finished the pillow with a quilt style binding in Kona coal. The inspiration for this pillow was a lovely letter press card I saw on etsy by krankpress. 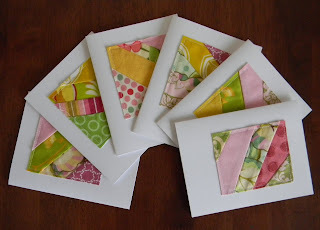 It's funny how a quilt inspired card can become a card inspired quilt. 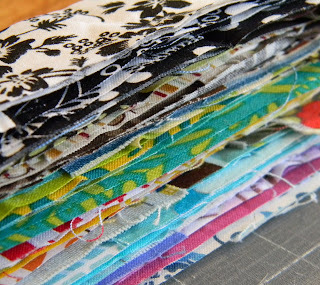 I feel like I have been cutting the fabrics for my Metro Link quilt for weeks now. Oh, right, I have been. It's cutting all those individual pieces of scraps that takes so long. Once you get to the background fabric you can zip along as usual. I'm trying a new fabric for the solid. It is Quilter's Linen by Robert Kaufman. 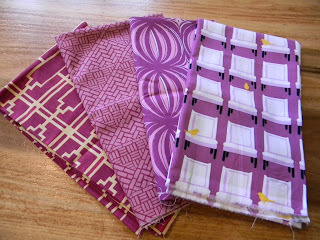 It is regular quilting fabric, printed with a subtle grain to resemble linen. I'll let you know what I think of it as I progress, but so far the Straw color I chose is a good look alike. What you see here are the 617 individual pieces required for the quilt. 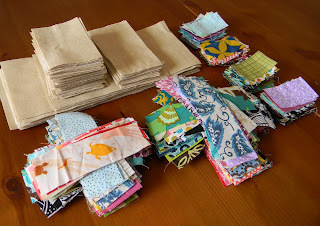 Just think of the scraps I'm using up! 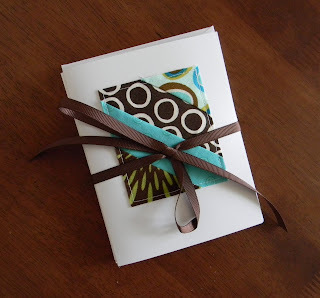 I even used some leftover strips to make more pieced note cards which are now in my shop. Phew. So why are my scrap bins still so full? 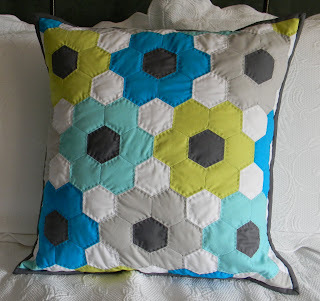 After making the hexagons by hand and hand sewing them together, I decided to finish my project with hand quilting. Why not. Up until a year or two ago, I quilted all my quilts by hand. As I was drawn more and more to modern quilting, I was attracted to the options created quilting by machine. And all this made me wonder, is machine quilting more modern than hand quilting? Certainly machine quilting can be used to complete traditional quilts and to make very traditional motifs (think old fashioned feathers, etc. 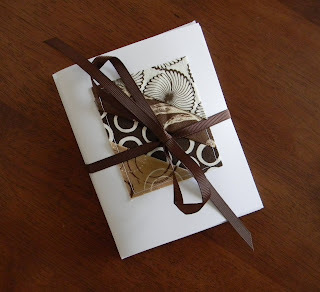 ), but it is also used in fun, innovative ways in many modern quilts. 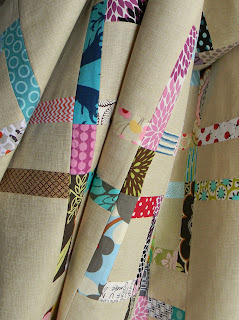 I've even seen some really cool combinations in modern quilts of machine and hand quilting used together. 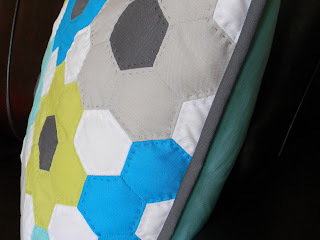 So, can a completely hand quilted quilt be modern? 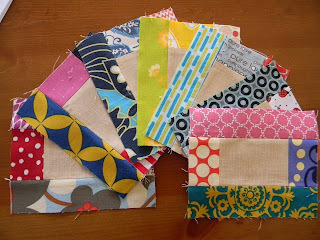 Is it the shapes used, rather than the method of stitching that makes quilting old fashioned vs modern, or something else? I've tried to make my hand quilting more modern by using embroidery floss and larger stitches to emphasize the quilting. Hey, I took time to hand quilt this, so I want you to notice. 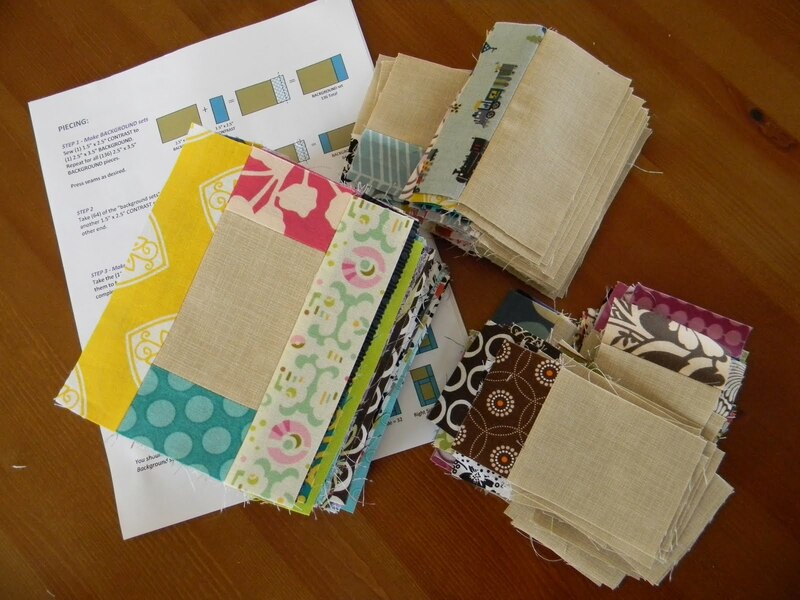 Other modern quilters use a variety of colors of floss or outlining to do the same thing. So what do you think. Is hand quilting more retro cool or traditional? I've seen a new improv technique popping up all over that I've been wanting to try. Jacquie's done it, and it shows up in Jean Well's and Malka Dubrawsky's new books. 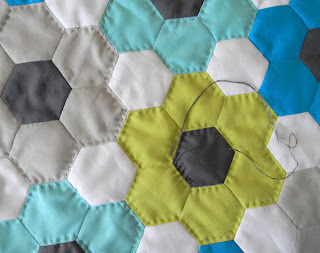 Using a rotary cutter with no ruler builds subtle waves into your piecing. 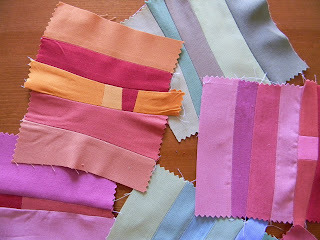 Then the edges of the strips are joined without pinning. See a fun tutorial on this technique here. Piecing these blocks was the quilting equivalent of stream of consciousness writing. Those strips look nice together. There we go. Now let's piece a little orange bit in there. Too short; guess I'll add another strip. Not sure where this is going, but it's been fun so far. 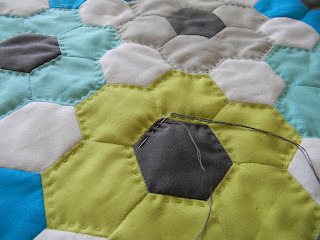 I've begun sewing my solid hexagons together. 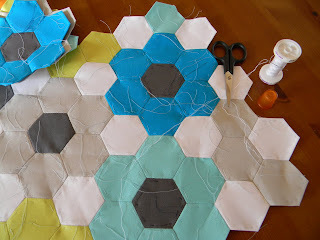 Making the hexies is so quick, but sewing them together is more time consuming. It's slow going. I've started my Metro Link quilt too. 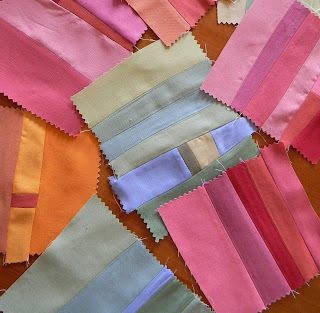 I scoured my scrap bins to cut narrow strips of just about every fabric to be found. Now I'm cutting the strips to the sizes in the pattern. This is also going to take a while!